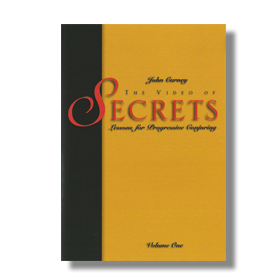 John Carney is widely acknowledged by his peers as a modern master of sleight of hand. In these videos, John offers twelve lessons, most of which have never appeared in book or video before. 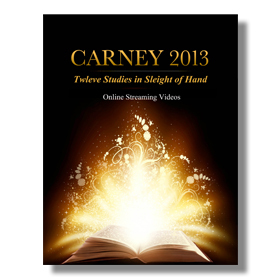 In each installment, Carney demonstrates universal principles which are applicable to any magic you undertake. This is the next best thing to private instruction with John, at a fraction of the cost for a single lesson. This is “A” Material from John’s repertoire – not trendy magic “products,” gimmicks, or silly rehashes. John will lead you through his process as he demonstrates how to make your own material evolve, through thoughtful creative choices. Think you know the classic Mora Balls and Net? John reveals the secrets of making a simple trick into something truly magical. This is very commercial, visual magic, that packs small, and plays big. Three roulette balls are magically produced, one at a time, in a very clean manner. They then inexplicably disappear from one hand to reappear in the other. One of the balls is placed in the pocket, but still, three remain. This is repeated, each time, stressing the fairness, and yet three always remain. Finally all three balls disappear at once. Several methods for this classic trick, with John’s fresh and original approach. New Hook ups and Ditches. New Methods and Techniques … with a pull, and without! Polish your technique like a pro! Sometimes what holds us back are the tiny details missing from the tools we use everyday. Proper technique achieves a consistent outcome by paying attention, “even to trifles,” essential incremental adjustments that separate the experts from the dilettantes. Fix these fundamentals, and everything you do looks more polished and professional. Tips and touches to improve; Top Change; Glide; Palming; Counts; Double Lift; Crimps; False Shuffle; Force; Side Steal; The Pass … and much more to learn in the process! From the master Eddie Fechter, comes an entertaining and astonishing Cards Across routine that takes off in an unpredictable way with a surprise twist ending! This is a very commercial card routine that John still uses as part of his “A” repertoire. Discover the touches and techniques that have made it one of his favorite showpieces. Here is a pure manipulative card routine that may be done under intimate conditions.It begins with a clean and visual production of four aces from mid-air, and ends with them vanishing one at a time, to re-appear in four different pockets! John’s variations on Fred Kaps’ Purse Frame Routine. From a small bag-less purse, the magician produces two different coins, seemingly from nowhere. What follows are vanishes, more productions, transportations, transpositions, and penetrations, in one beautifully choreographed routine. Strong magic and gags, with; Straws, Glasses, Plates, Silverware, Sugar Packets, Matches, Coins, Rings, and Napkins. John’s clever variations on the Great Leon’s miniature illusion, where the spirits come to life, tying knots in ropes, animating toys, drawing spirit pictures, and finishing with a ghostly face that appears and floats in space! John’s ideas make the entire routine more natural and baffling. A perfect illusion of snatching a signed bill from mid air amongst other decoys, while blindfolded … with chopsticks! An entertaining and novel mystery from John’s Comedy Club act. 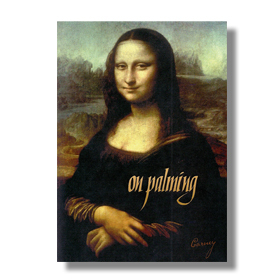 Visual and Entertaining card work from John’s “A List” working repertoire. Shared here are several unpublished methods, stratagems, and subtleties. Not full routines, but tips and twists that make classic routines smoother, more deceptive, and amazing. You will own these videos, and have access to watch as often, and as long as you wish. 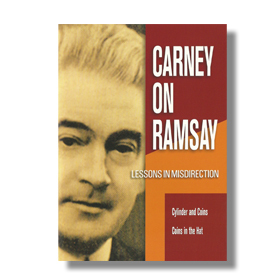 … a master class … This entire series is worth its weight in gold, and it is priced so reasonably that there is no reason miss out. I truly feel that I have a mentor guiding me along my magical development. The video platform is easy to use. I personally got more than my money's worth from one lesson, but I have felt that way about each of the lessons. … easily been one of my best purchases in the last year … No fluff, no distractions, just solid material and information. ... expounds upon that which is essential to good magic …… well produced, worthy of study, and very easy to install/use. ... an unbelievable value ... destined to become another magical milestone ... I couldn't be happier. There are poor magic investments, good magic investments, and a truly rare bird, extraordinarily worthwhile magic investments ... this is one of them. 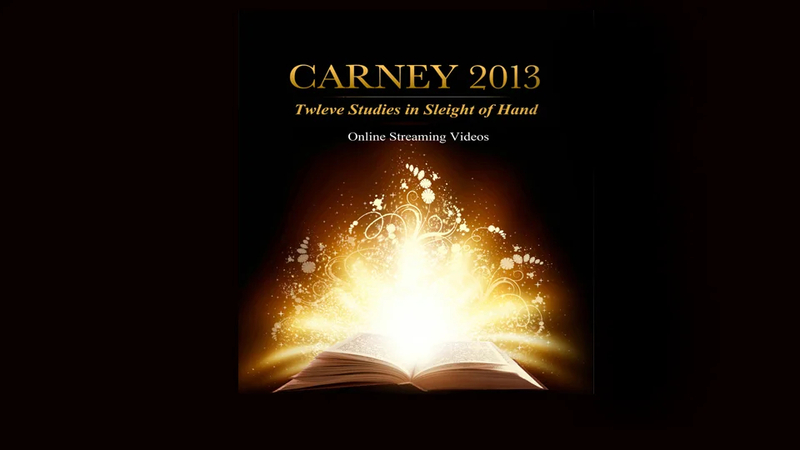 All content of CARNEY 2019, John Carney/CarneyMagic. *not available as a download, as a DVD, or from dealers.